Heart from our FALL seriesis a perfect match for many of our other posters in the FALL series. As always we hope you will find your own story and reason to hang this poster on your wall. You can order our artwork posters in 4 different sizes. 21x30 cm, 30x40 cm, 50x70 cm and 60x84 cm. Frames are widly avaliable in these particular sizes. We always send the posters in sturdy cardboard tubes which secure them during transport. We use gloves when we handle the posters so that fingerprints do not get on them. All our posters are designed, produced and shipped from Denmark. Secure payment VISA, Mastercard, MobilePay and Paypal. Money back GuaranteeNot satisfied with your order, return and get your money back. Free Poster Free 30x40cm poster if order exceeds 15 - 35 EURO (Amount varies). You choose in Checkout. Shipping to Europe Your shipping is calculated in checkout, we deliver to all countries in Europe. Each month we draw a lucky winner to recive 2 posters for free! The winner is annonced in our newsletter! Cheap, modern posters for your home, living room, bedroom, halways and more. At PAPAPAPA we have a wide range of styles that fit into the modern Nordic home. As with all art, the interpretation is up to the eyes that seee. 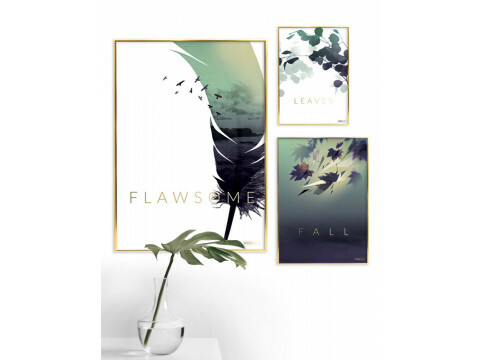 Take the time to browse through our many posterdesigns and let yourself be inspired! See all posters series here. PAPAPAPA designs and produces graphic posters. Our designs are inspired by the Scandinavian nature and lifestyle. We design our posters in series. Poster - Grafical posters - Danish design and production of posters!